I've had this problem for years, with W7 and W8 and now W10. The last person I spoke to about this a long time ago told me to just buy Mixcraft. I almost told him where to shove it. I don't like Mixcraft and I don't want Mixcraft. 9 times out of 10 this is what I see when I open a sgp. The project consists of mainly single WAV files and a few grouped ones. I've tried several different compatibility combinations, and each time the program will go wonkers and mess up the location to the Temp folder, instead selecting some non-existent folder with random foreign characters resulting in a program crash each and every time. I change it back to Acoustica_Temp, try to reopen the sgp....another crash. I switch it back to no compatibility, the crashes stop but the black screen remains. I enter a different temp folder, change compatibility to XP-SP3, project opens but I can't zoom in to the mouse's location and it instead zooms in to the very beginning of the timeline, which is aggravating & project-killing to say the least. I figured it might be a graphics problem so I might need to change some settings in Nvidia control panel for the program, but I wouldn't know where to start. Try to imagine how aggravating it is to wanting to continue working on your project, only to get that black screen 20-30 times in a row. As you may know, Acoustica MP3 Audio Mixer is a very old piece of software, which is why someone probably suggested you try Mixcraft. We can't guarantee old software will continue to function perfectly well with all the updates Microsoft makes to Windows. Try going into the Properties > Compatibility Mode settings for MP3 Audio Mixer and selecting "Reduced Color Mode" with "16-bit (65536) color" selected. Does that help with the black background problem? In regard to the temp file thing, once you select a valid temporary file folder, you should be good for that particular installation of MP3 Audio Mixer. Are you not finding that to be the case? In regard to zooming, it should zoom based on where the caret is. 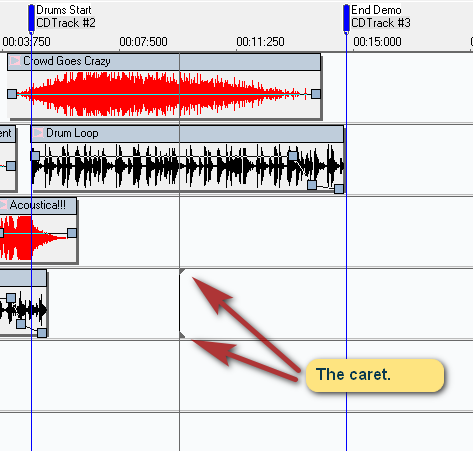 If you click to the right somewhere to set the caret (as depicted below), is it not zooming on that? Changing the color settings only turned the black into grey lol, but otherwise same end result. It was ironically amusing (or amusingly ironic). The temp folder issue only occured after I changed the compatibility settings. I changed the temp folder back, but it glitched out again. Only after I removed the compatibility settings and once again changed the temp folder it stayed as it was. And I can understand the software being very old, I remember using it back in 2001 when I was just 16 years old. but it still has a price tag attached to it which means it SHOULD BE in working condition for newer OS's as well. Noone uses anything older than XP anymore, and under 10% of PC users are said to still be on XP, as opposed to almost 50% being on W7. You could say the same thing about MP3 Audio Mixer Vs Mixcraft, but the difference is XP is still fully functional based on what it's supposed to do, which is why you can still buy XP-run machines from pc retailers. But MP3 Audio Mixer has not been fully functional for years since W7 came around. Yet it's still on sale without a proper compatibility update to make it fully functional post-XP. I'm not running into the black screen problem here with Windows 10. It's not a universal problem. Have you checked to see if there are updates for your graphics card? There may be some other graphics or compatibility setting that you can select that would avoid the black screen problem. Did you try compatibility mode with 16 colors? Did you try overriding the high DPI scaling behavior? If anyone purchases MP3 Audio Mixer at this late date and finds it doesn't work properly with their particular computer configuration, we do have a 30 day refund policy. And of course, we have a free trial, so if anybody finds it doesn't work properly for them during the free trial, they shouldn't purchase it in the first place.